Mackenzie Horton is an Australian distance swimmer who specializes in freestyle. He has been in the international stage since 2012. Mack swims with the Melbourne Vicentre Club under his coach, Craig Jackson. Mack is the first male swimmer from the state of Victoria to win a gold medal in the 400 m freestyle at the Olympics, and was recently awarded the Nicole Livingstone Trophy as Victorian Swimmer of the Year. Mack swam championship record times in the 1500m freestyle at the 2012 Jr. Pan Pacific Championships, and the 200m, 400m, 800m, 1500m, and 4x100m freestyle at the 2013 World Jr. Championships. He also set junior world records at the 2014 Australian Swimming Championships in the 400m and 1500m freestyle. 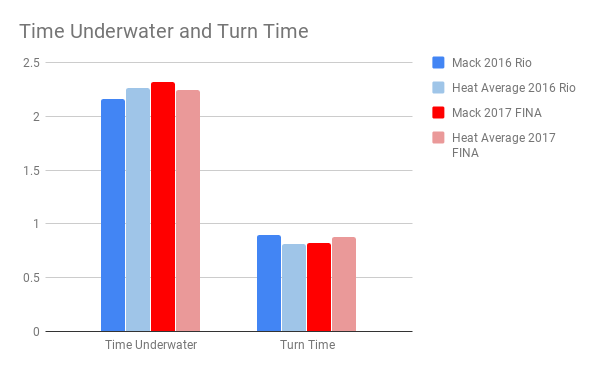 We looked at Mack’s metrics in the 400m freestyle at the 2016 Olympic Games and compared them against his metrics from the same event at the 2017 FINA World Championships to gain a few insights from his performance. We also looked at the heat average in each race for comparison. Mack’s stroking strategy for both years was to pull with high DPS at a slower stroke rate. In both competitions, he produced higher than average distance with each stroke, at a rate which was slower than average. Compared to the previous year, his DPS declined by around 4% in 2017, but he supplemented this with approximately 2.63% increase in the speed of his strokes. This would also explain his higher overall stroke count for that year. 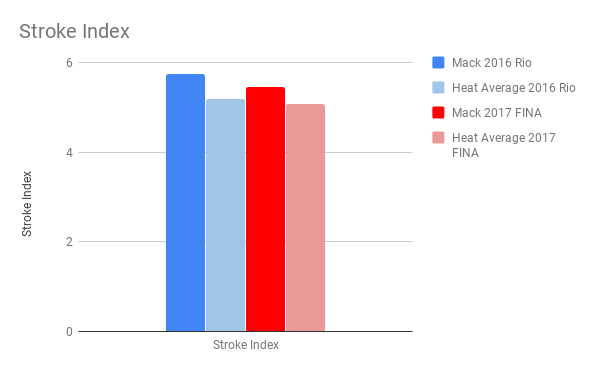 Despite the slight drop in his stroke index in 2017, Mack swam with better efficiency than the rest of the field in both years. This goes back to his higher than average DPS and speed. He was able to use longer strokes to generate more speed, which translates into higher efficiency. Mack’s transitions saw a slight improvement in 2017, compared to the previous year. On average, he was turning slower than his competitors at the Olympics, but was faster than the field the next year. Granted, the average turn time of the heat in 2017 was slower, Mack’s personal average turn time still dropped by almost a tenth of a second in 2017. His time underwater fell right below average in 2016. In 2017, he spent approximately 0.16 seconds longer underwater, now spending slightly longer than average underwater. While these changes seem marginal, considering this event was 400m, the changes in transition metrics easily add up.